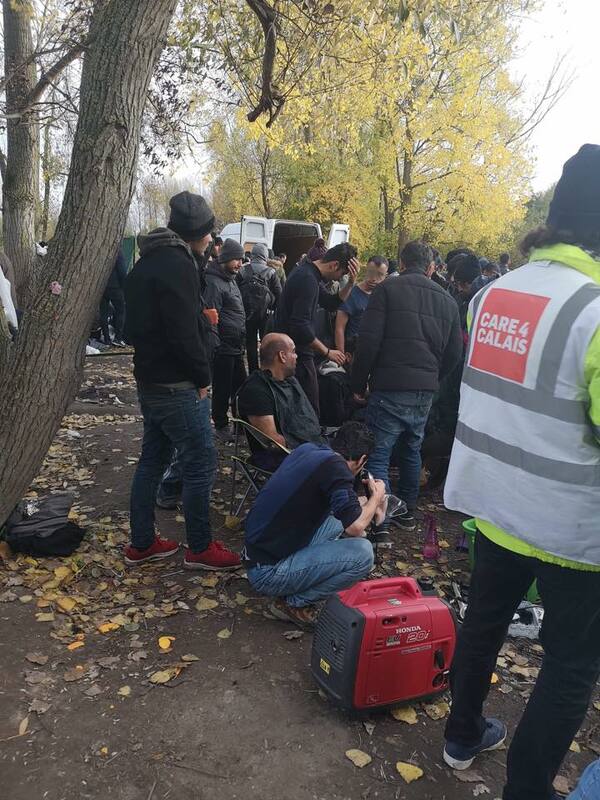 Approximately, 200-250 people are still in Dunkirk after the big clearance a couple of weeks ago, staying in isolated spots in the woods with no cover or protection from the elements. Care4Calais have continued to offer vital humanitarian aid during and after the clearance in Dunkirk. The majority of people here are from the Kurdish areas of Iran and Iraq, often they have been in the UK for long periods of time and now find themselves desperately trying to return. The weather is now turning nastier with first aiders seeing more cases of infectious disease (possible TB), fungal foot infections due to the wet ground in which they live, and general cold and flu symptoms associated with the harsher conditions. Today we saw an increase in CRS and police presence and we have been told the that the CRS will again come to Grande-Synthe tomorrow morning to arrest, remove, and clear people who have stayed in Dunkirk. Tomorrow a maximum of 20 refugees will be taken by CRS to a detention centre if they don’t have papers and are new to the area. If they are not detained refugees will be forced from the area for the second time in three weeks.